Olga Dysthe, professor of education at the University of Bergen, separates student writing into two categories: thinking-writing and presentation-writing. The first kind happens when students are working through an issue. It is private and usually unstructured, such as talking to yourself. The second kind is normally assessed: formal (or formulaic) and undervalued by students as anything more than a grade. Reflective blogging is a great tool to combine the best of both of these types of writing. Blogging gives kids an authentic audience. That audience may be their classmates, their school, or the whole world. We need to show the value of writing by having more readers than the teacher. Blogging also provides a new avenue for feedback. Teachers can gauge understanding by reading their students' blogs. Commenters (known and unknown) can provide new questions and comments to deepen learning, too. Writing online allows a discussion to continue regardless of time and location. This freedom can improve new teacher training, and there's no reason to believe that the same benefit wouldn't extend to students. Personally, I reflected on my teaching at the end of each week last year. Sometimes it was painful to admit to the world that a lesson flopped, but it also helped me focus on finding new strategies to help me reach my students. I've used three main platforms to encourage my students in their reflective practice: WordPress, Weebly, and Tumblr. There are many other blogging tools out there, but I chose these three because they're free and easy to use and allow students to continue their blogs after the class ends. Here are the strengths and weaknesses I've found for each tool. Benefits: Lots of templates to use (some free, some not). User can require approval for comments. 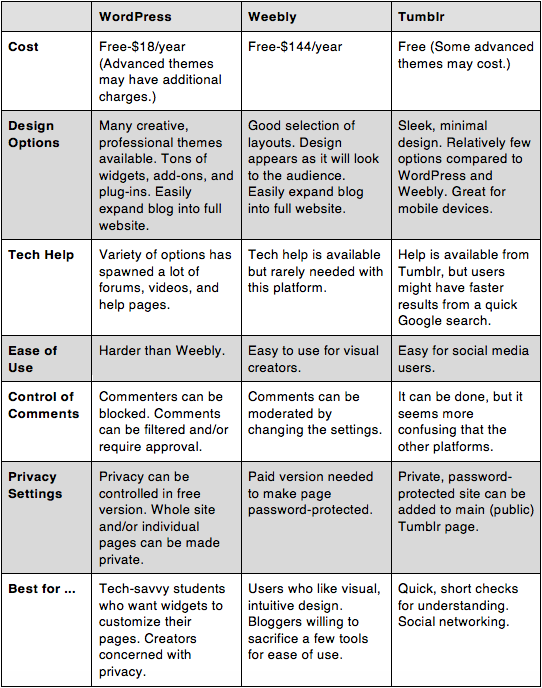 User control of privacy settings (this is the platform I prefer for blogs where I want to limit access). Versatile page design. Ability to track page hits. Free and paid versions. Lots of help sites and tutorials. Tons of customization available. Lots of widgets, add-ons, plug-ins, and so on to incorporate. Great for deeper reflection on learning. RSS feed can make it easy to follow. Drawbacks: Too many options for some users. Less intuitive page design. Not designed specifically for kids. Some elements require research, coding, or advanced computer skills. Benefits: Easy-to-design websites (to complement blogging or easily build a portfolio). Very easy to see design choices. Intuitive to use. No coding needed. RSS feed can make it easy to follow. Drawbacks: Some media tools require paid subscription. Controlling privacy settings also requires paid subscription. Fewer plug-ins and add-ons available in general. Benefits: As easy as social media. Sleek and minimal layout (could be a drawback, too). Can build class community and build digital citizenship. Easy, quick updates that are best for end-of-class mini-reflections. Easy for use on mobile devices. Drawbacks: Students need to add ability for comments. Tumblr account needed to track updates. More focused on getting followers, getting reblogged, and the like. More customizable themes require paid subscription. Blocked by some filters. Take a risk. Help your students reflect on their writing using these tools or others recommended by Common Sense Education. Having real readers see their writing can only help your students. Reflecting on learning can only deepen it. This type of assessment will give a more authentic picture of your students' mastery. WS 11-12.4: Produce clear and coherent writing appropriate to task, purpose, and audience. WS 11-12.6: Use technology to produce, publish, and update writing products. WS 11-12.10: Write over extended time frames (especially to reflect) as well as shorter time frames.